We at C-PHI Engineering are engaged in research and innovation. We aim to contribute to fundamental and applied research of geotechnical engineering and earthen construction. In this effort, we continuous keep ourselves updated with international research and improve our own innovations. We have contributed to research through publication in internationally reputed journals and attending international conferences. Based on the our research knowledge we implement them in our projects with client's consent for better productivity. Professionals, Contractors, Researchers, Students or anyone interested can reach us. We would be very happy to have a intellectual discussion with you! Below are the list of research publications of the C-PHI Engineering Team! Muguda, S., Lucas, G, Hughes, P. N., Augarde, C. E., Cuccurullo, A., Perlot, C., Bruno, A. W., & Gallipoli, D. 2018. 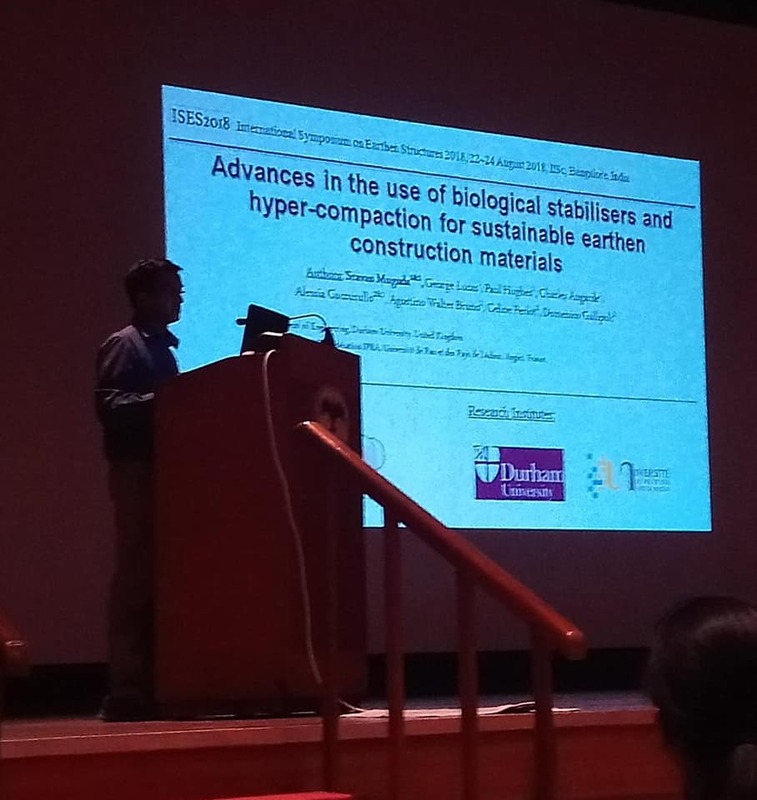 Advances in using biological stabilisers and hyper-compaction for sustainable earthen construction materials. International Symposium on Earthen Structures 2018, IISc, Bangalore, India. Muguda, S., Booth, S.J., Hughes, P.N., Augarde, C.E., Perlot, C., Bruno, A.W. and Gallipoli, D., 2018. Preliminary study on use of biopolymers in earthen construction. In UNSAT 2018, Hongkong. Nagaraj, H. B., Sravan, M. V., & Deepa, B. S. 2018. Factors influencing undrained strength of fine-grained soils at high water contents. Geomechanics and Geoengineering, 1-12. Muguda, S., Booth, S.J., Hughes, P.N., Augarde, C.E., Perlot, C., Bruno, A.W. and Gallipoli, D., 2017. Mechanical properties of biopolymer-stabilised soil-based construction materials. Géotechnique Letters, pp.1-6. Sravan, M.V. and Nagaraj, H.B., 2017. Potential Use of Enzymes in the Preparation of Compressed Stabilized Earth Blocks. Journal of Materials in Civil Engineering, 29(9), p.04017103. Nagaraj, H.B., Rajesh, A. and Sravan, M.V., 2016. Influence of soil gradation, proportion and combination of admixtures on the properties and durability of CSEBs. Construction and Building Materials, 110, pp.135-144. Nagaraj, H.B., Reesha, B., Sravan, M.V. and Suresh, M.R., 2015. Correlation of compaction characteristics of natural soils with modified plastic limit. Transportation Geotechnics, 2, pp.65-77. Sravan, M.V. and Nagaraj, H.B., 2015. Preliminary study on use of TerraZyme as a bio stabilizer along with cement and lime in compressed stabilized earth blocks. 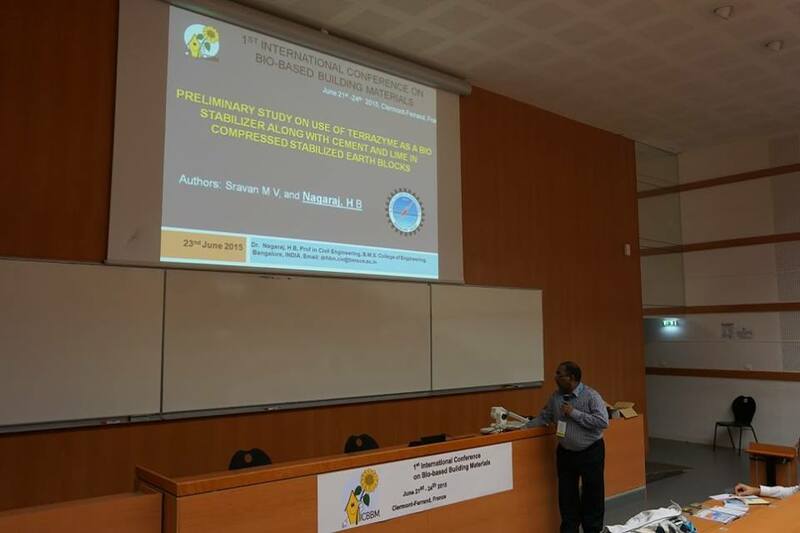 In First international conference on bio-based building materials, Clermont-Ferrand (pp. 1-8). Nagaraj, H.B., Sravan, M.V., Arun, T.G. and Jagadish, K.S., 2014. Role of lime with cement in long-term strength of Compressed Stabilized Earth Blocks. International Journal of Sustainable Built Environment, 3(1), pp.54-61. Sravan, M.V. and Nagaraj, H.B., 2013. Effectiveness of Lime as a Stabilizer along with Cement in CSEBs. In 4th Young Indian Geotechnical Engineers Conference, IIT Madras (pp. 51-55).